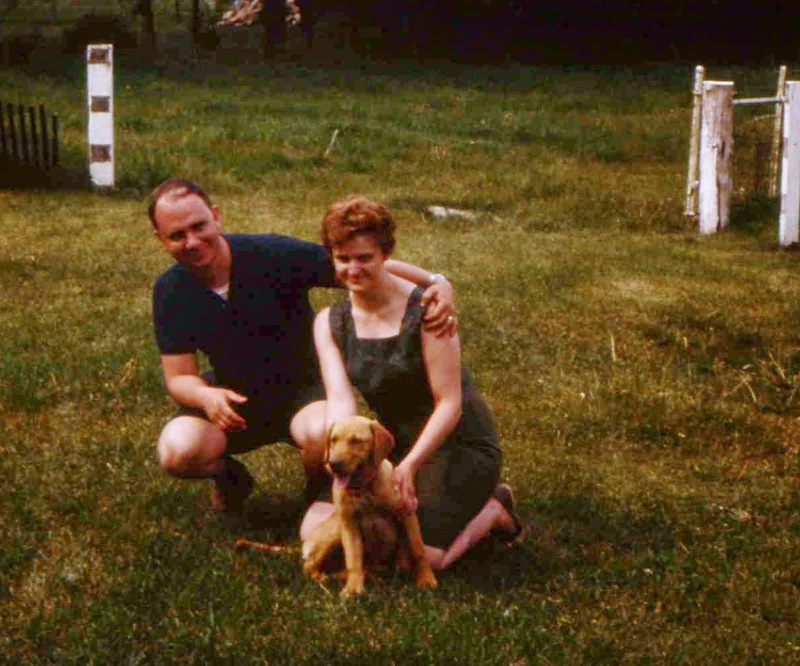 In the years that have past, since our Steel River trip, many things have changed. Some have stayed the same. My brother Greg has passed on due to cancer but then, we had young families, mortgages, careers to tend to and other responsibilities. We were not as cautious then. We knew of death but didn't believe it applied to us. We were a long ways from help and there were no cell phones. Today age and health issues would definitely preclude me from dragging a one hundred pound canoe up a cliff…. Still, important lessons were learned about perseverance, self-reliance and teamwork. Today my love of nature and wilderness remains. I still go fishing and canoeing though now only occasionally. Sigurd Olson and Aldo Leopold still speak to me thru their writings. 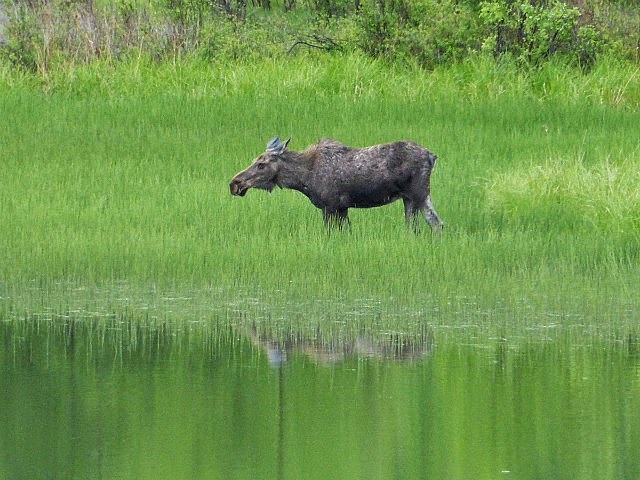 Should I never again be able to find my way back to those wild places, like the BWCAW, Canadian rivers or the backcountry of Yellowstone, I will continue to rest well knowing they are still there. The Steel River country has changed a lot in recent years as well. Several major wild fires charred parts of it. Perhaps, as a consequence, bad floods have occurred there. 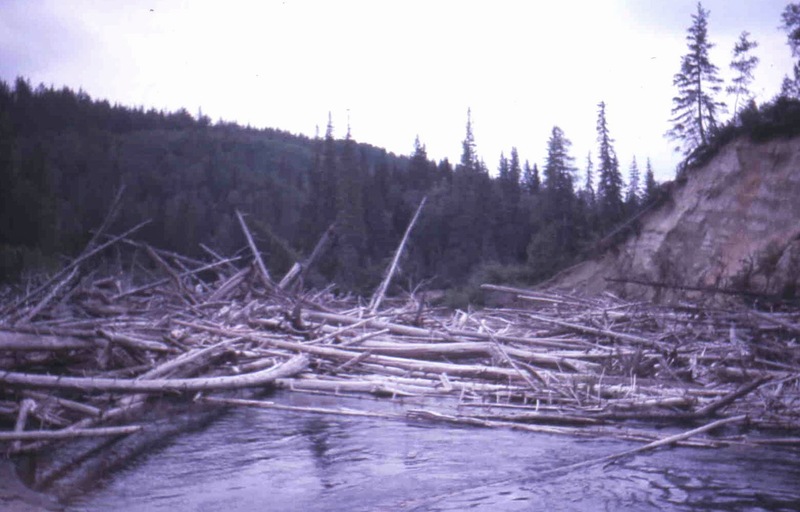 The floods have wrecked portages, by making them impassable and created huge logs jams, especially in the lower reaches of the river. Although more people are taking this route now the difficulties of travel beyond low or too high water have increased. There are new routes into the area, as it is possible now to just do the river part of the loop and skip the lake section. This means, above all avoiding the Diablo portage up the mountainside. .
My brother Greg unloading the canoe at Santoy Lake, getting ready to head home. For us timing was everything. We were among the earliest but not the first to make the journey so we had decent information. The river level was just right. We were lucky. Now, new threats have appeared there as well as in Minnesota.. Copper, nickel and gold mining are being surveyed. There are people today working to preserve this wilderness. I wish them success. We had a beautiful and easy paddles the next couple of days. 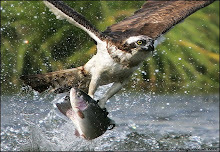 The fishing was great, lots of wildlife and fantastic scenery. 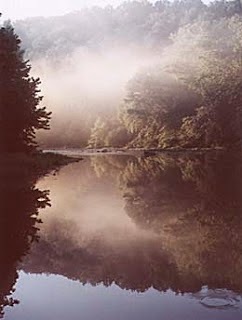 Serenity is a rare commodity for many of us. We had found it in the Canadian wilderness. Mostly just by gliding along, not a care in the world. We did not see a single person the entire trip. 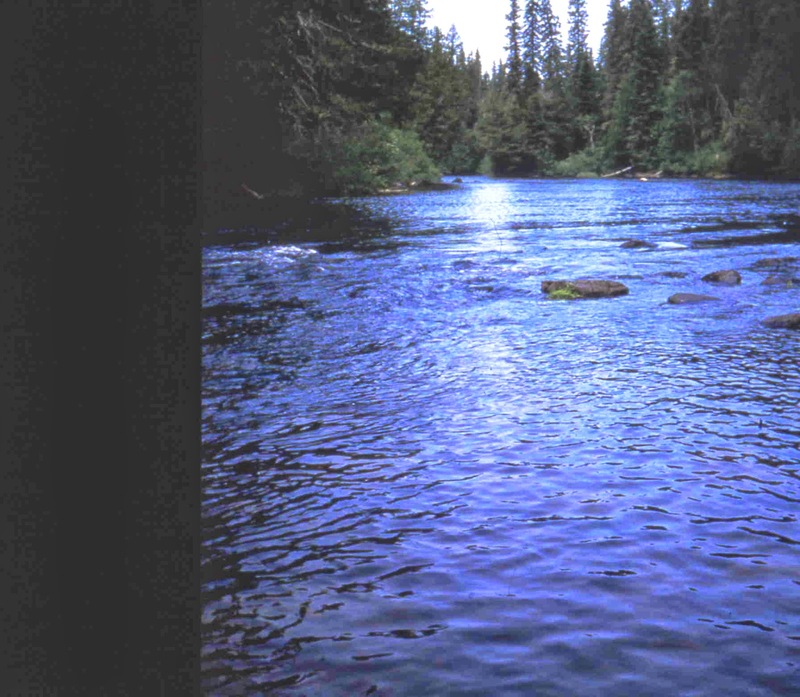 The river was bigger now and running smooth and strong as by mid-afternoon we approached our moment of truth. Its name was Rainbow Falls. More a cascade than a falls, it had about a 80 foot drop, we could hear a low rumble as we rounded a bend for our approach. 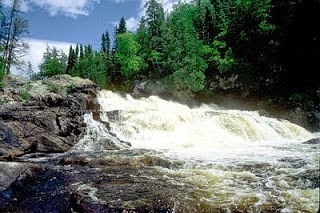 While the map we were given had its blank spots and inaccuracies, the falls was clearly marked, as well as the portage. We had to run a "ferry" to approach the portage but fortunately there were no mishaps. To the non-initiated a "ferry" is what you do when something dangerous is downstream from you and its necessary to cross a river to a safe landing on the other side. If you go straight across the river, the current may drag you downstream and sweep you over the falls. The trick is to angle your canoe about 45 degrees upstream and then paddle like crazy. The result is to cross the stream without going downstream any further. As I’m writing this post it obviously worked! This is the view from a rock overlooking the falls. 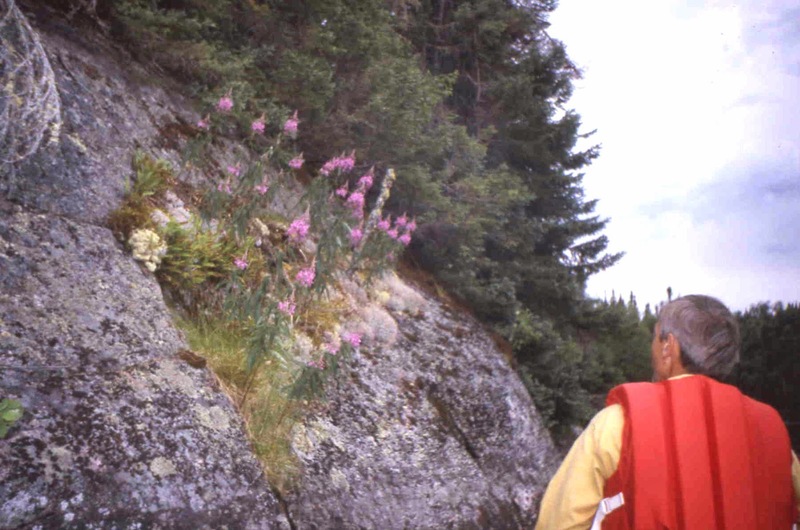 The portage itself was steep in spots but relatively easy going downhill. We stood below looking back at the falls. The power and roar of tons of water rushing over the precipice almost shook the mind. We found a nice pool below the second set of rapids and called it a day. By this time we were not even concerned about catching our supper. The dehydrated food wasn't bad. We boiled our water and added Kool Aid for drinking. We hadn't gone hungry yet. The walleye fishing had been good throughout the trip and we usually fished from shore during our breaks and when camped for the night. The walleye had come as a big surprise to us, in the Steel River.... THEY WERE BLUE. 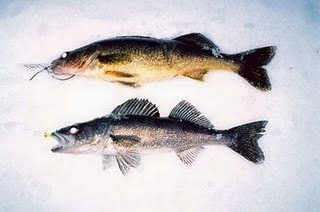 In Minnesota walleye come with yellow or white bellies. We were not aware that a rare blue bellied type existed. 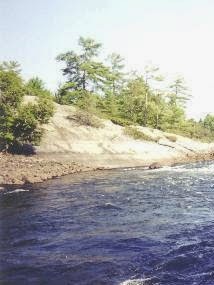 The next morning we entered the lower section of the river as the current slowed , the bottom and banks became sandy and the landscape had a boggy look to it. We paddled on leisurely until we came to the outlet delta into our old friend Santoy lake. 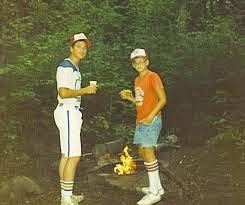 There we camped near a sandy beach knowing tomorrow we would cross the lake and return to civilization. The next morning found us up early and after breakfast we headed south into a dense cold fog. My brother Greg leading the way across Santoy Lake and end of the loop. Next: Our Steel River Adventure in Retrospect. Duluth packs and gear stowed and ready to go. On the morning of our fourth day in the canoe, we had an easy two hour paddle, completing our long paddle up Steel Lake, to the first of several portages leading into Aster Lake. Aster Lake formed the apogee of our route and from that point we would turn south and begin thankfully to run the Steel River. We initially found the river to be smooth sailing with only a few minor rapids. If the water had been higher, with sweepers and log jams, it would have been dangerous or have required many more slogging portages. Lower and with rocks and boulders to be avoided, the river would have been too "technical," i.e. crashes into hidden boulders and wading and dragging the canoe would have been the order of the day. It was a big relief to be able to follow the strong current thru easy chutes and minor rapids. We had little paddling to do other than some steering and avoiding the occasional rock. 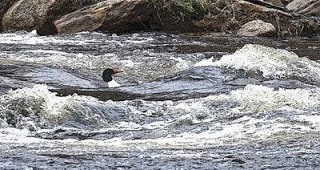 At one of the first rapids, where we could see straight ahead to the very end, a duck appeared. I wasn’t into birding then, so I’m not sure what kind it was, possibly some kind of merganser. He would be at the head of the rapids and then dive underwater. His reappearance several hundred yards downstream amazed us at first. This little guy seemed to be leading the way as he repeated this performance several times. The idea was, if this little duck could make it ... so could we! We sailed thru without a scratch. 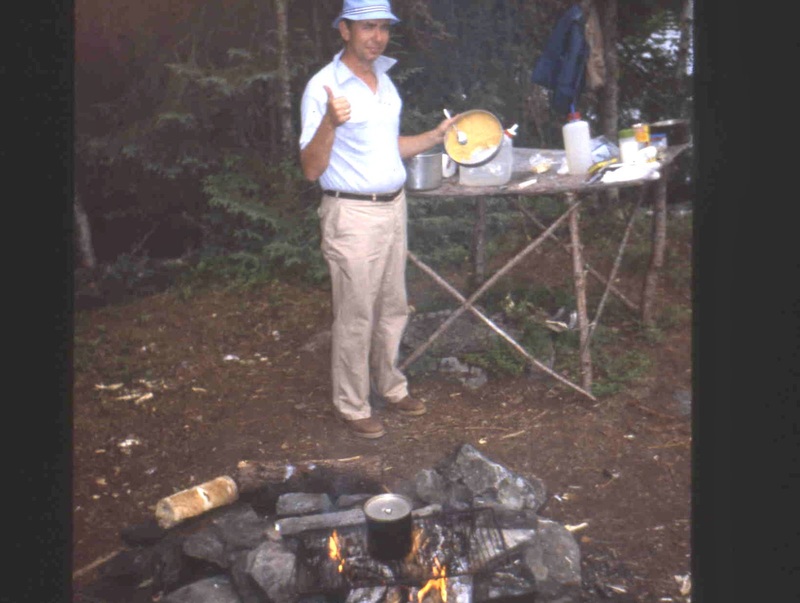 The scenery was stunning with rocky bluffs and the forest for a backdrop.We liked to set up camp by mid-afternoon as that gave us time to catch our supper and relax around a campfire. About that time, we found a flat area about twenty feet above the rocky shoreline. It was covered with moss and lichens and looked especially soft and comfortable. This proved to be a big mistake. In our tent, that night, we found ourselves being bitten by a mysterious insect we couldn’t see. "No-seeums" they are called. No-see-um ... yep, you sure can feel-um even if you can't see-um! Apparently we had disturbed their home in the moss. Our only alternative was to spend the night out of harms way, our heads buried in our sleeping bags. Not good as it was too warm and stuffy. The next morning we began our second day on the Steel River confident we could handle any more challenges. At the crack of dawn it was foggy as usual. The rapids we did encounter would best be described as Class II technical. We checked them out carefully, decided our route and with only the occasional "eddy turn," had no difficulty negotiating them. 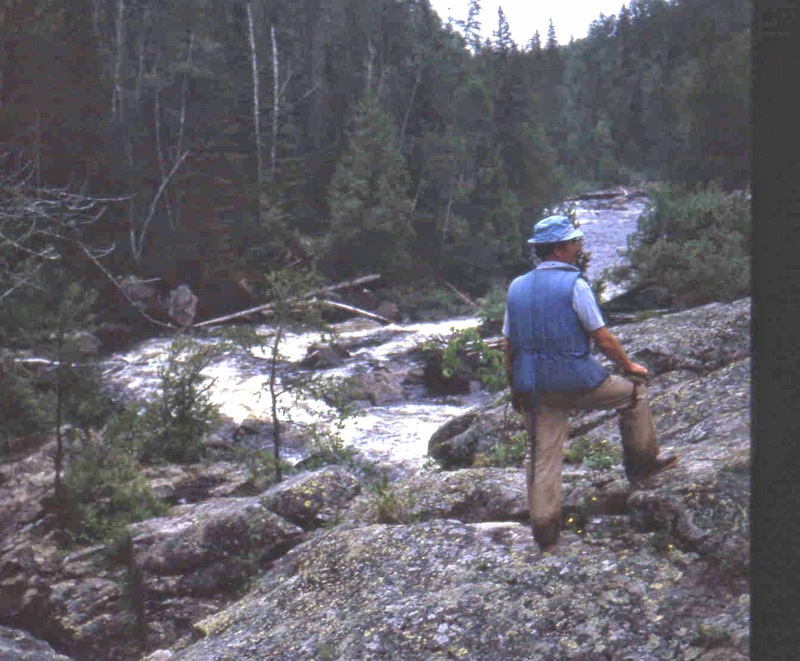 In those few cases, where we were uncertain as to advisability of running the rapids, we chose to portage. The thought of wet sleeping bags and clothes was not appealing. And yes we did some fishing along the way. The next day we awoke eager to move on. We followed a narrow winding little creek thru a series of beaver ponds, portages, lifts over beaver dams and muddy shallow wades, finally into Steel Lake itself. Steel is a very long lake, maybe 12 miles, oriented on a north south axis. There was a slight breeze and drizzle out of the West as we followed the eastern shoreline at a leisurely pace. Wildlife abounded here. We saw black bear, several moose, in shallow bays, munching in the water, beaver and even some playful otter along the way. We had not, however, seen another soul since leaving Santoy Lake. The view ahead consisted of the lake and low hills on both shorelines with many small coves and rocky outcrops. We didn’t fish much that day as it seemed a good opportunity to cover the miles. 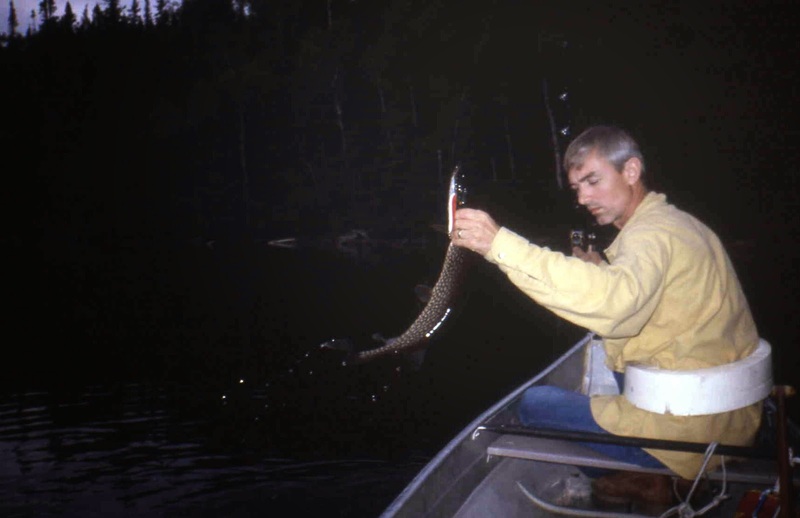 According to Ontario Fisheries, Steel Lake is excellent for Walleye, Northern Pike, Largemouth Bass, Smallmouth Bass, Lake Trout and Yellow Perch. Some days though you just have to keep moving on. 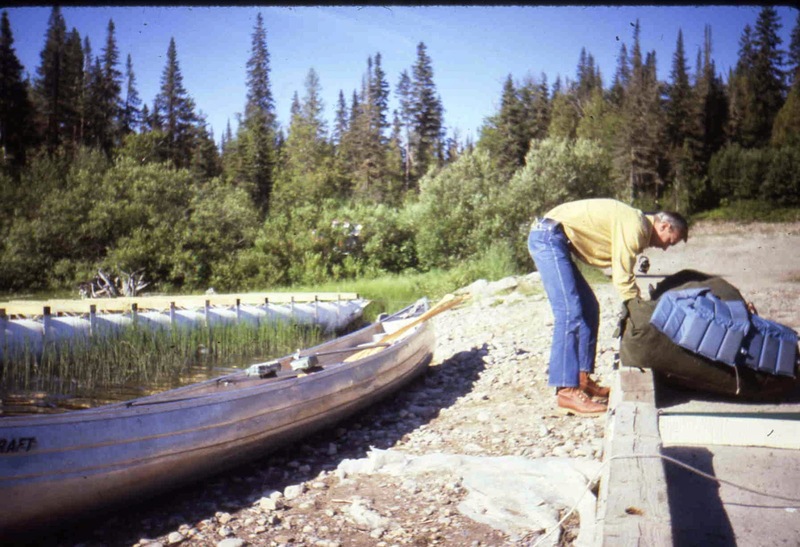 We had seen a few fishing boats "cached" along the shoreline previously that day and assumed some “locals” knew a less strenuous route into Steel Lake than we had pursued. 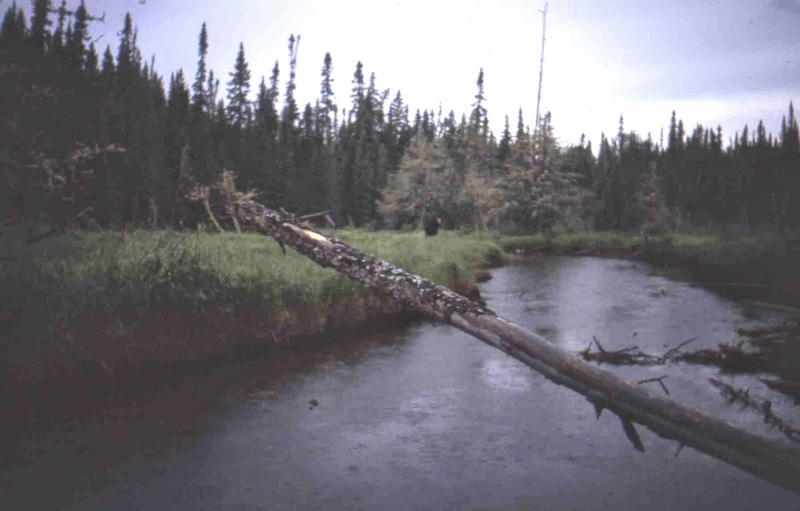 A few isolated logging tracks were known to exist. They certainly hadn't carried their boats and outboards up Diablo portage. The soreness of the previous day lessened as our muscles slowly became acclimated to the strain. At about mid afternoon we pulled over about two thirds of the way up Steel and called it a day. Some skinny dipping was in order to wash off the mud, sweat and assorted grim. It felt wonderful! 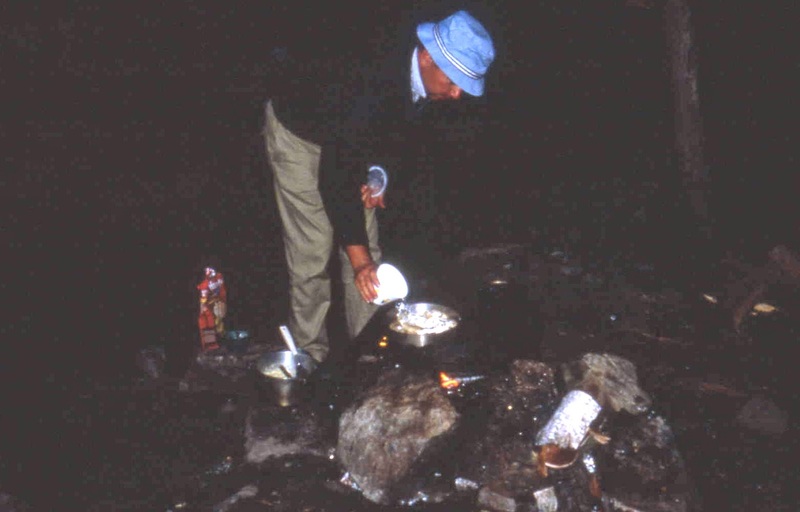 Then after setting up camp we dug into our dehydrated food that night for some variety. The stroganoff was surprisingly good along with some hot cocoa and gorp. We had boiled water to fill our bottles. As the sun set over the western horizon we sat by our small campfire and listened to the sounds of the wilderness. 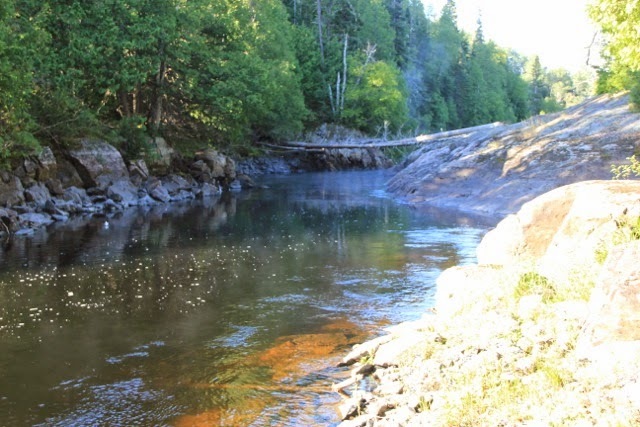 Ontario’s Steel River route makes a giant loop clockwise from Santoy Lake, north of Lake Superior, and back to the starting point. If all went well (including lots of fishing) the trip should take about ten days. We had been told by the "locals" that none of the portages were marked. In the days before GPS systems this would take some skill or a lot of luck. 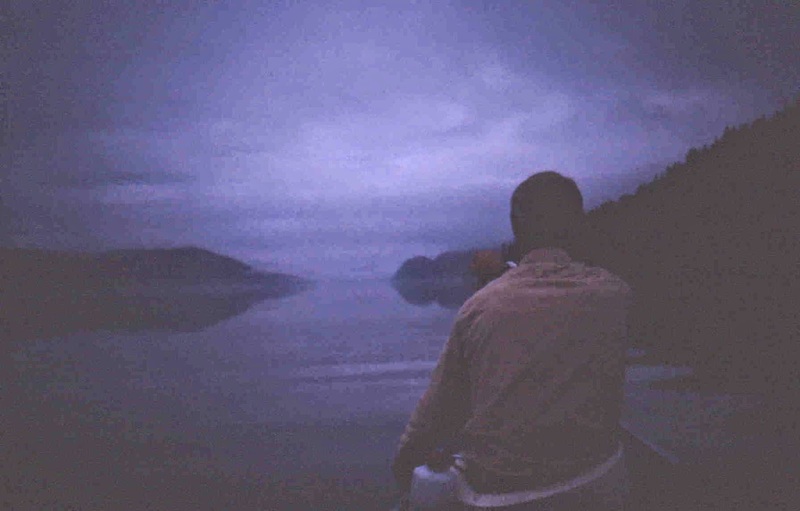 The next morning we began by heading north going up the west side of Santoy Lake. The Devils Portage was a long climb up a very steep bluff to Diablo Lake. This climb of what ultimately would be around five hundred feet gain in elevation and over a mile would make the circle route possible. From Diablo Lake we would head due north, along a long series of lakes and portages, through some of the most beautiful landscapes in all of Ontario. 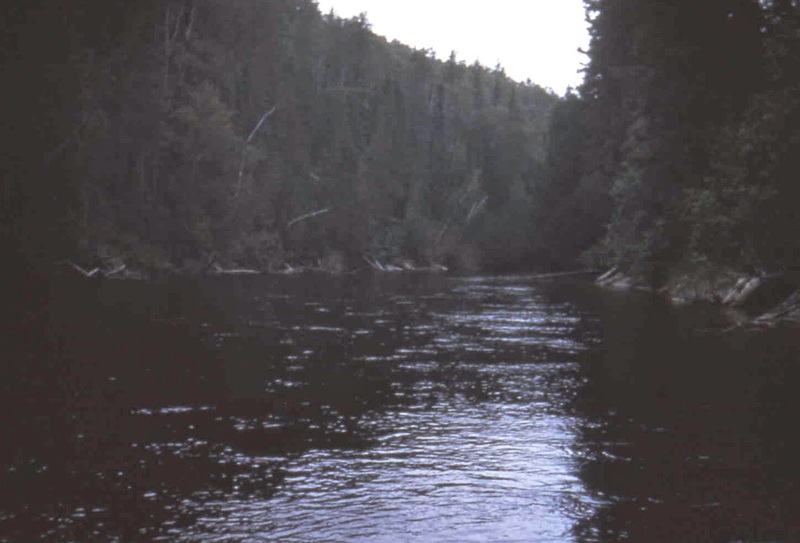 Then we would turn south into the Steel River drainage, facing rapids and cataracts, to return to our starting point. We had difficulty even locating the portage. This route was known by the locals but was not, at that time, heavily used to say the least. 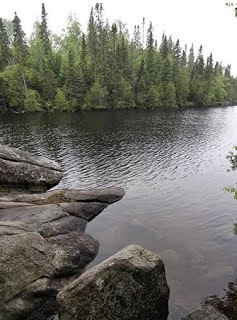 There were no trail markers like we were used to in the Minnesota Boundary Waters. The day was warming up rapidly and it soon became obvious to us that carrying a heavy canoe, climbing up a mountainside around huge boulders, over crevices, slippery moss covered rocks and numerous other obstacles, was going to be extremely difficult. It was some years before I was able to purchase my 45 lb. 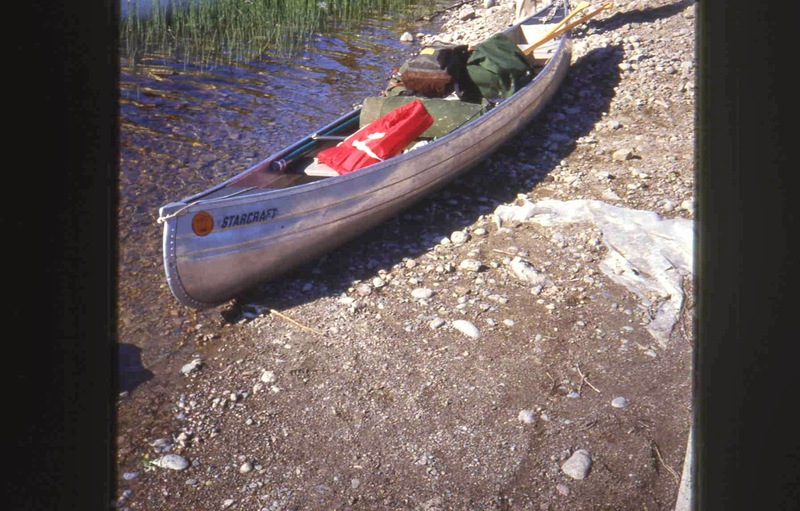 Mad River Kevlar canoe, so it was the old battered Alumacraft, weighing over 90 lbs. that made this trip. Then stupidly we didn’t have any water with us as we intended to stock up when we reached Diablo Lake. 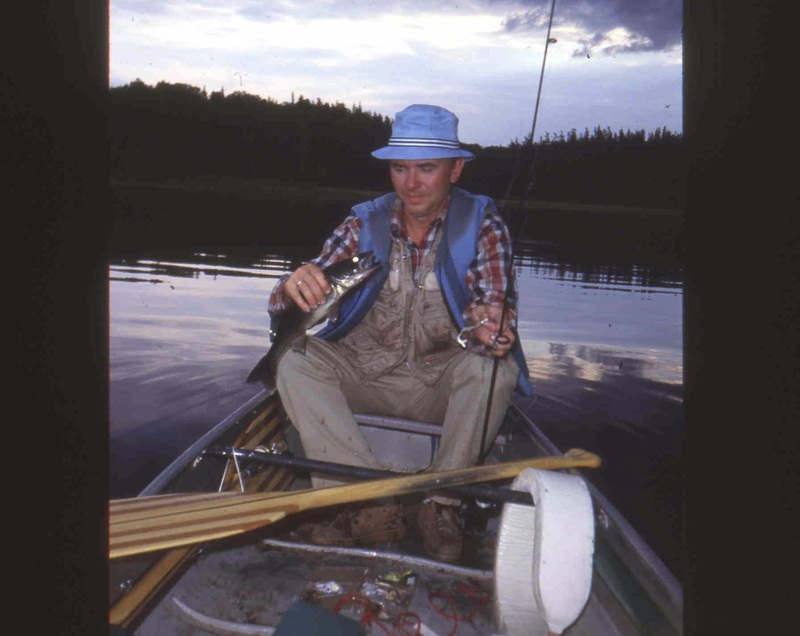 This and several other errors, like having a heavy axe strapped inside the canoe, began to add quickly to our misery. It was all simply hubris on our part. 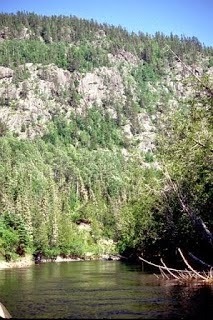 We were not prepared to challenge a portage that turned into a mountain climb. 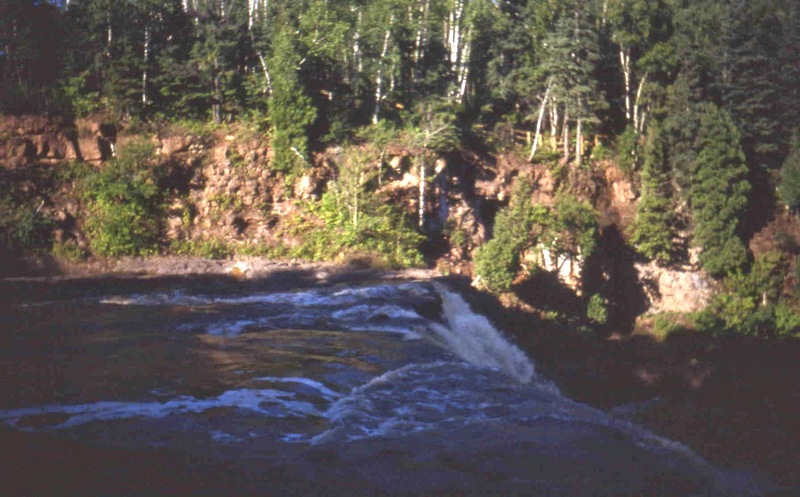 The portage from hell was basically divided into three parts. The first section was the worst. We must have gained 300 feet in elevation in only several blocks distance. The gradient at that point might have been forty degrees. Although I have only seven years on my brother Greg his physical conditioning saved the day. At the steepest points, I pulled the bow and he pushed from below, holding the canoe over his head. When we had to retrace our steps to get our gear, he always took the heaviest loads. The second section was easier but dangerous in that moss and ferns covered the so called trail making each step an ankle twisting nightmare. 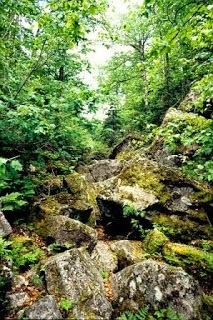 The last section saw us having to negotiate over and around huge boulders, some the size of small cars. Fallen trees and root tangles didn't help either. Four hours later, totally exhausted, we collapsed, having finally reached the Diablo Lake. Our first priority, after catching our breath, was to rehydrate ourselves. We paddled out into deep water, filled a large kettle, then transferred the water to our bottles and applied the proper awful tasting pills. 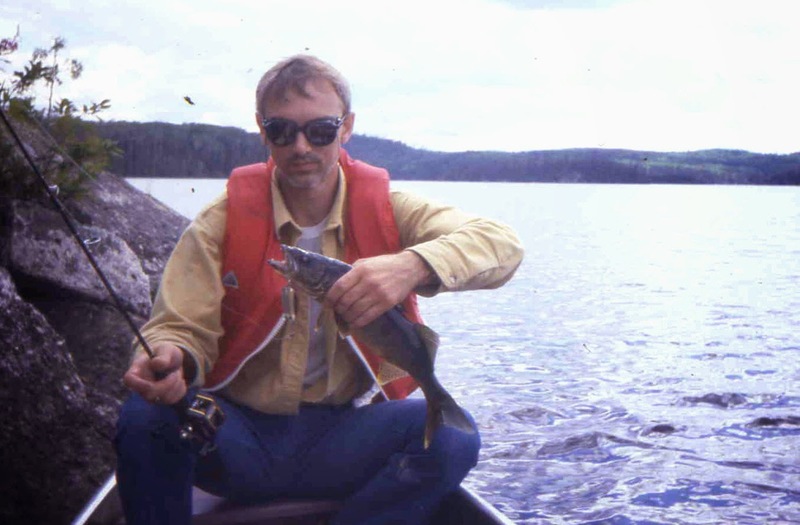 This was to make sure giardia (beaver fever) did not become a problem. We were very grateful for the water, if not the taste. The rest of the trip we boiled all our water to be safe. It must be said Diablo Lake itself was absolutely gorgeous. 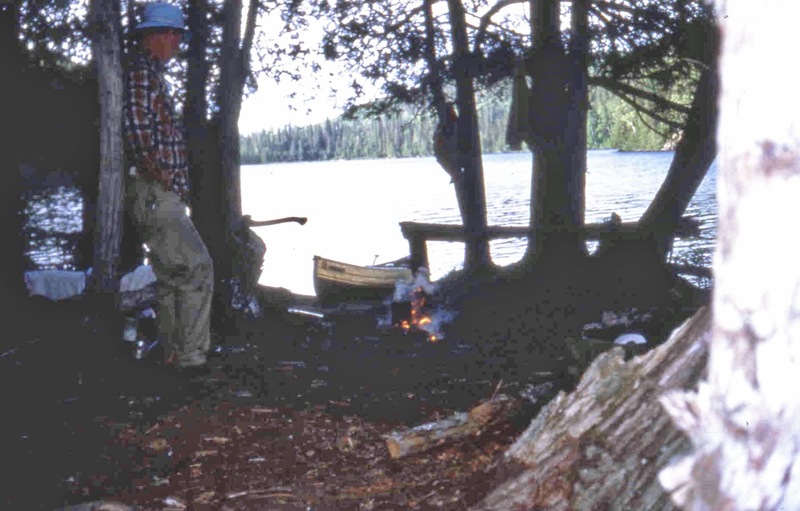 The locals had informed us that it harbored some very nice "specs" (brook trout) and with that in mind we decided to make camp on the first island we came upon. 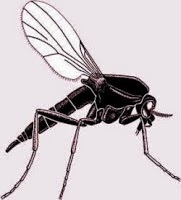 Islands were always preferred because any breeze from any direction would help reduce mosquito attacks. It turned out to be perfect. A swim in the cold water was all it took to make things seem a lot better. Was supper waiting there in the crystal clear water as well? It was. 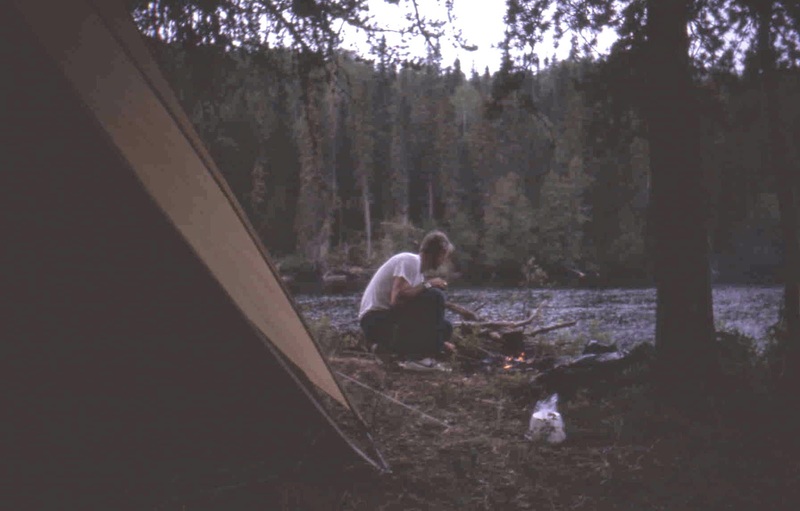 There is nothing quite like sitting by your tent, on a log , cooking supper, a trout dinner actually, in front of a small crackling campfire, in the lengthening darkness of the wilderness. A million stars overhead. We heard the haunting cry of a loon in the distance. Life was good. I’ve been thinking of putting a few "episodes" of this blog into permanent form in a scrapbook. This led me back to its beginnings more than a thousand posts ago. I’m making a list and checking it twice and with a few minor revisions some these will be reposted. There were few readers back in those days but I love writing and so kept going. To be certain, the following true story occurred when I young and foolish. Unbeknownst to me, at the time, my young wife, showing more sense than me, and with our first child and a home mortgage in hand, took out a large short term life insurance policy on me and said somewhat skeptically, "go for it tiger." 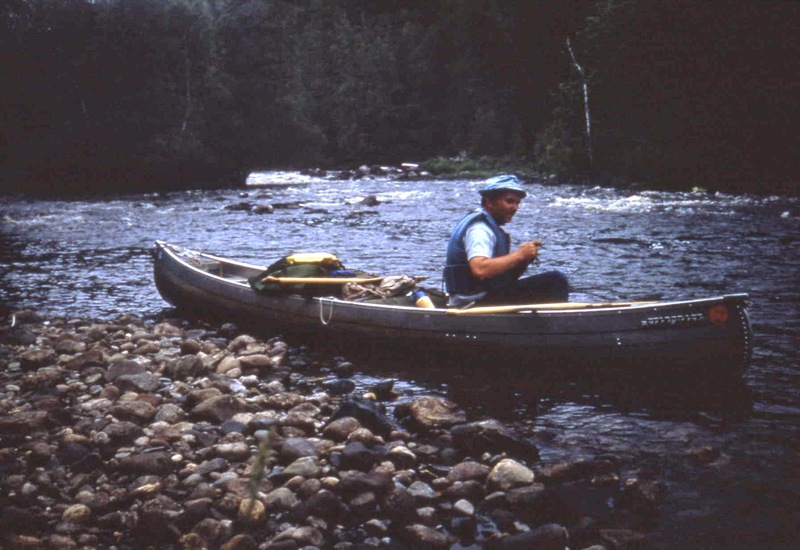 It was one of famous author Cliff Jacobson’s books on wilderness canoeing that led one of my younger brothers and me to believe "we can do this." 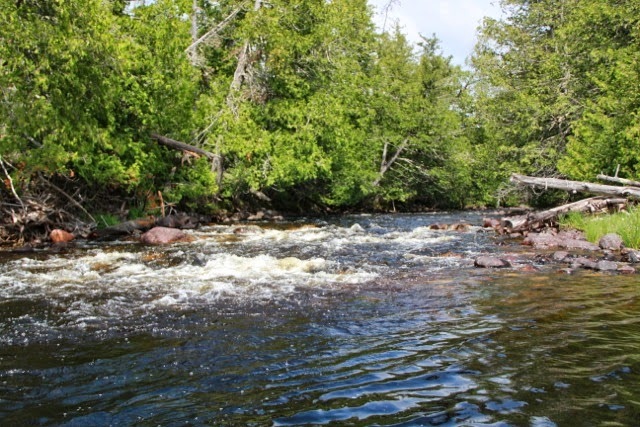 We were experienced canoe campers in the semi-wild Boundary Waters Canoe Area of northeastern Minnesota’s Arrowhead Country. 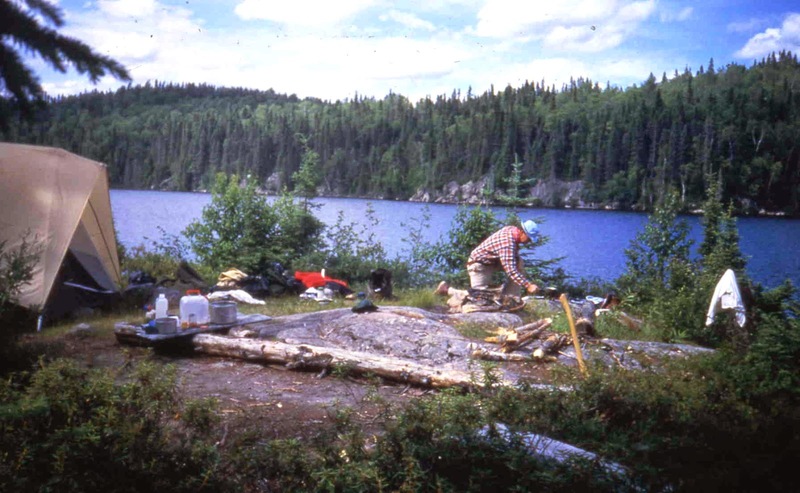 "This" was a two man-expedition into the true wilderness of Ontario, north of Lake Superior. We were sure it was not beyond our abilities and experience. The deciding factor was that it was a "loop" route which we would be paddling. No roads, no people and no cell phones in those days in case of serious accident.... you were on your own. It also meant we would make a giant arc for more than a week, through a chain of lakes heading north, and then enter the Steel River drainage, completing the circle south to our starting point. Neat idea we thought. The plan was to drive from the Twin Cities and cross the border into Canada. 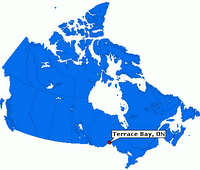 Then follow the highway, along the northern shore of Lake Superior, till we came to Terrace Bay, Ontario. Here we would get permits and some maps at the local Ranger station and then proceed about 16 miles east to a turn-off heading north a few miles to Santoy Lake. We arrived at Santoy early in the evening, and checked out the landing. It didn’t amount to much but canoes don’t need much either. Santoy was a beautiful lake which stretched north into the distance for more than 12 miles. 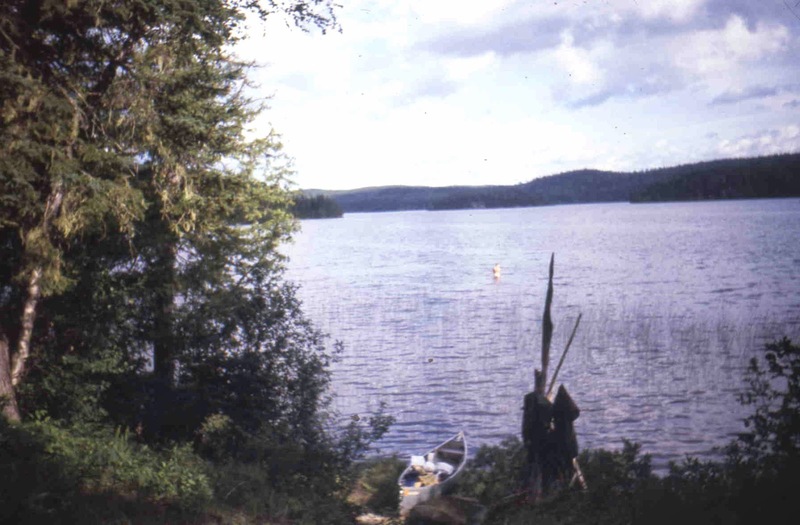 It would be some distance to find our first portage along the western shoreline. We had been warned by the Ranger (among other things) to keep a sharp eye. None of the portages were marked. We headed back to the van for a sandwich supper and intended to turn in early as it had already been a long day and drive. As dusk settled around us, a number of pickup trucks began to arrive down by the lake. Soon a bonfire appeared and much laughter and shouting ensued. Of course, we had to investigate. It was the Friday night gathering of local pulp mill workers. Discovering that we were Americans, they felt it incumbent upon themselves that they should offer us several choices of beer. 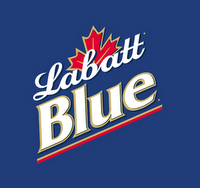 It was Molson or Labatt’s. 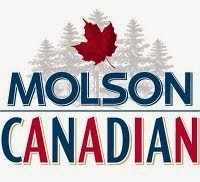 As the evening progressed it became apparent to us that one of the most vital controversies facing the Canadian nation, at that time, was the relative merits of each of these fine brands. As the discussion on this sudsy issue became more heated it occurred to me that, at some point, we (the neutral Americans) might be drawn in to "settle" the argument." "Not a good idea," I thought. I was able to turn the discussion at a few points to the question of fishing along our planned route. Some advice was given but the name of the "Diablo Lake portage" appeared frequently and even ominously it seemed to me. Pleading an early start in the morning, we managed to escape (beers in hand) from further heated argumentation. A "devil" of a portage, they said. How devilish could it be we wondered? We were soon to find out. www.youtube-nocookie.com/embed/tHvExOg4NI0?rel=0 Oops sorry folks this one didn't work ... try below. 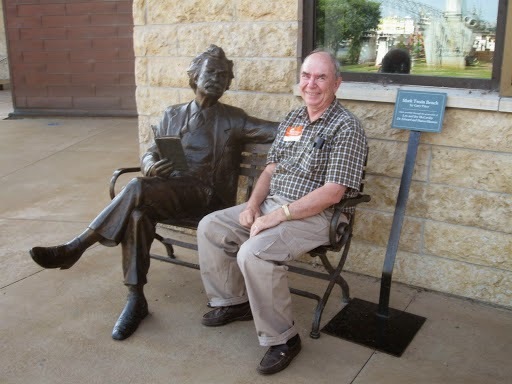 Visiting a nature center in Rochester, Minn. Deep underground in a mysterious cave.